Phones Review Quickie: All the Android faithful out there should keep an eye on the Android Market on their device because the word is an updated Android Market is now being rolled out to Android users and is apparently an auto-update that should hit you Android device sooner or later. 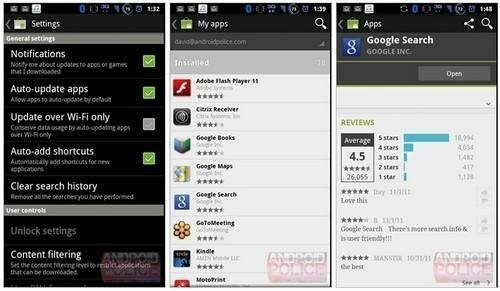 However, according to the guys over at Android Police, the update, Android 3.3.11 apparently doesn’t work all that well on Android Honeycomb slates as the guys say it has numerous glitches, but if you don’t wish to wait for the auto update the guys have the .apk file you can download. What the guys have found with the new Android Market so far is a new app drawer icon, star rating chart on app pages, smaller font, auto-update apps (presumably setting all apps to auto-update), auto-add shortcuts (auto-adds hone screen shortcuts), update over WiFi only, a microphone (voice command) button in search menu, and a few minor tweaks to the user interface. The guys also say that Root is not necessary and should you experience the Android Market force closing all you need to do is open Settings, Applications, Manage, Market, and clear out the data and this should fix it. Of course once you have received the updated Android Market to your device we’d love to know if you find anything else different so feel free to pass anything along by posting to our comments area below.